Time seems to be flying by on the NOAA ship Gordon Gunter as one day quickly runs into the next. I am learning so many new things, and doing brand new tasks that I am not sure where to begin telling my story. Every time something awesome happens I want to write it down, but something even more awesome happens. It’s such a busy work environment for the crew and the scientists! I am on the ship with a scientist whose job is to “disentangle” whales. Of course I had a million questions such as, “Disentangle whales from what?” The first night on board, we were treated to a “science talk” from David Morin of the Large Whale Disentanglement Program, Protected Resources Division of NOAA. Large whales can swim into and get entangled by gear of commercial fishermen. Apparently they swim into the gear, panic while attempting to get free, and make the entanglement worse. The gear can be in the form of long ropes, buoys, and even lobster pots. Disentanglement team trying to remove a gill net from a large whale. Photo credit Provincetown Center for Coastal Studies under fisheries permit number 932-1489. 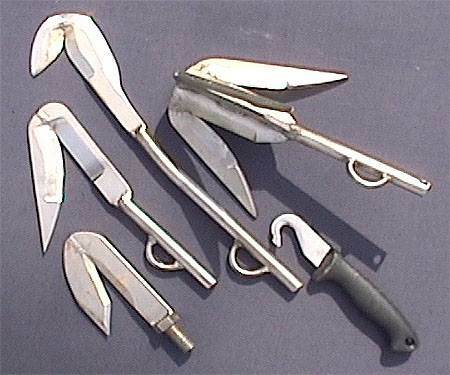 Tools used for disentanglement. Photo credit Provincetowne Center for Coastal Studies. Sometimes the whales can free themselves either fully or partially, but all too often they have to learn to cope with all the gear wrapped around fins, flippers, or flukes. The entanglement can become so tight and restrictive that it actually embeds into the flesh of the animal, creating deep gashes, and scars. 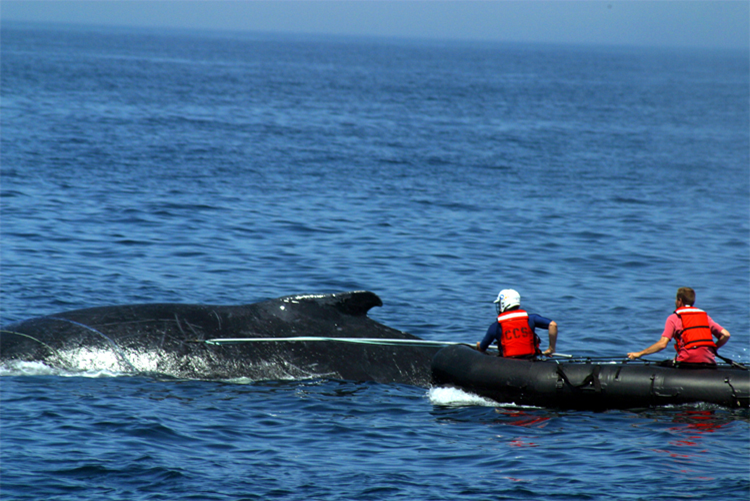 When an entangled whale is spotted and reported, a disentanglement team springs into action. 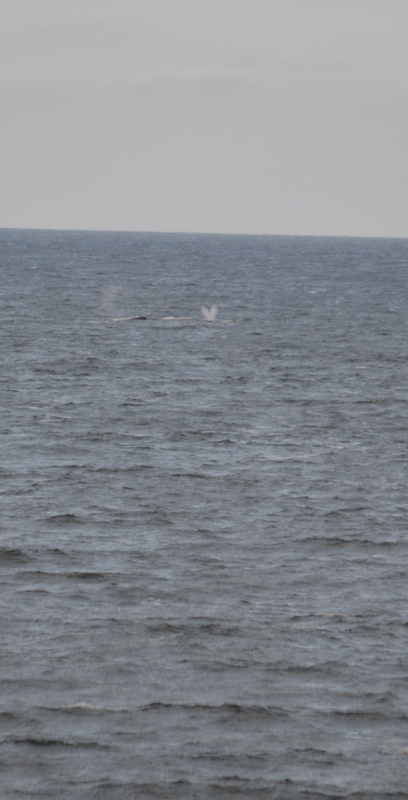 A large boat takes them to the reported location and a small rubber boat gets them as close to the whale as possible. With cameras mounted on head-gear, the disentanglement team must first assess the type of gear and configuration of the entanglement. Obviously every case is different, with a wide range of fishing gear, and different species and sizes of whales. Right then the small boat a plan is launched and put into motion to attempt to free the whale from its bindings using a variety of sophisticated cutting tools mounted to large poles. Disentanglement is a dangerous job. Photo Credit Florida Fish and Wildlife under fisheries permit # 932-1489. Dave has been in situations where the whale has become frightened and slapped a fluke down on the small rubber boat. 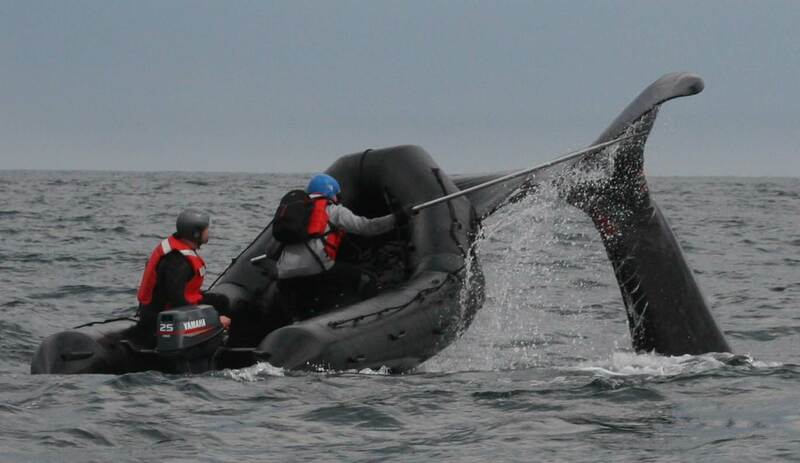 One swift move from a whale could be the end of a crew attempting disentanglement. This doesn’t stop Dave from telling the details of his work with passion and admiration for the opportunity to work with whales. I’ll stick with teaching! 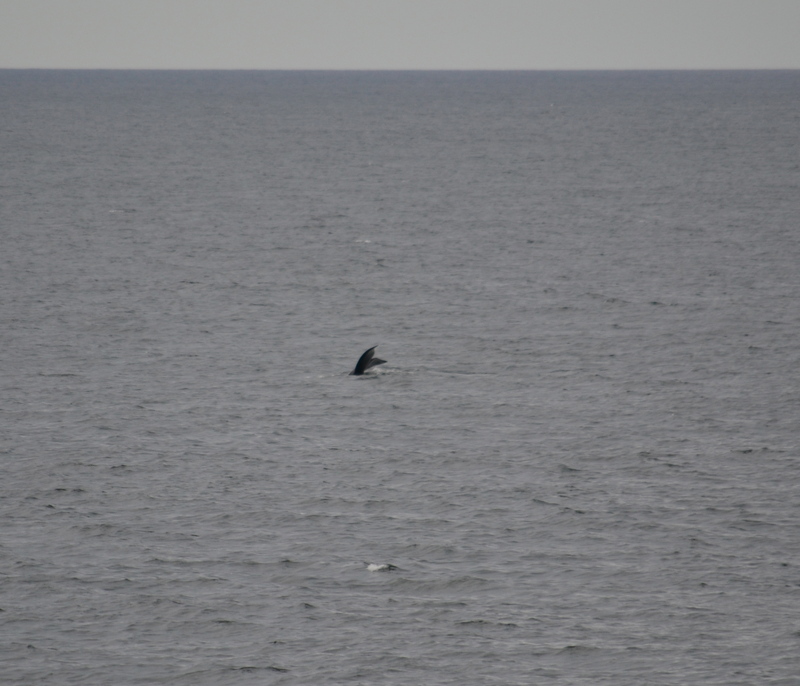 My job during the right whale survey has, so far, been very addicting! 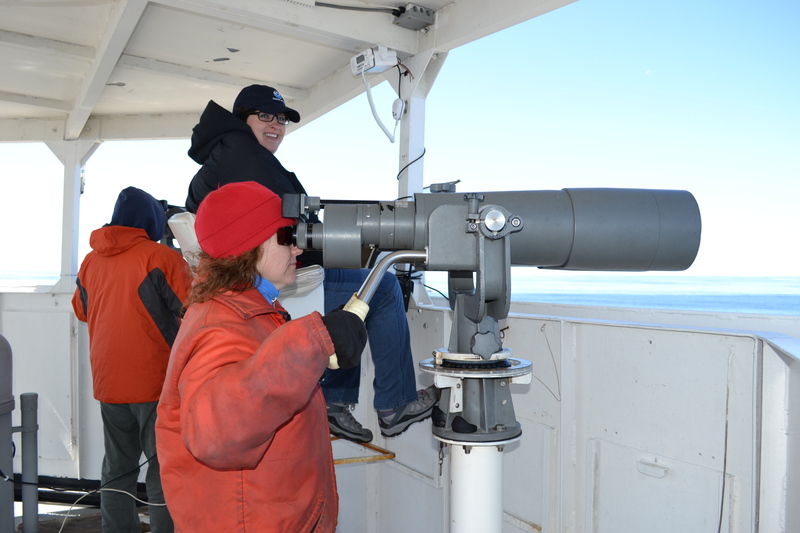 We run ninety minute “watch shifts” on the flying bridge searching for any signs of life, particularly whales. The flying bridge, the highest point on the ship, gives you the best vantage point when looking out into the ocean for marine life. There are three stations that I rotate through every thirty minutes while “on watch”. Station one is a set of “Big Eyes”, or really large binoculars. The view of the ocean using the “Big Eyes” is specific and fantastic! During that thirty-minute segment of my watch duty, I scan my side of the ocean, which is bisected by the bow of the ship. I look for any signs of life such as a splash, a “blow”, a dorsal fin, a fluke, or even “suspicious water patterns”. 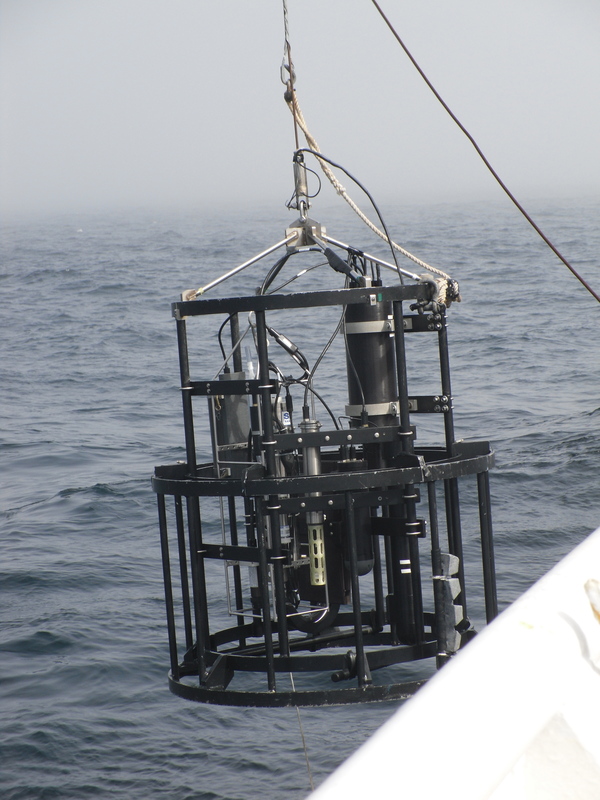 If I think I have spotted marine life such as a dolphin, seal, or a whale I shout out “SIGHTING” to the data recorder. I have to tell the data recorder very specific data about my animal sighting, which is added to a computer program. The middle station on the fly bridge of watch duty is the data recorder. This is the scariest job for me because sometimes multiple sightings have to be recorded at once. The third position of watch duty is thirty additional minutes on a second set of “Big Eyes”. Personal Log: Many people know that my hobby is “collecting scientists”! I have a rather eclectic sampling of amazing people that I have acquired through the years. Each one of them has an amazing supernatural ability that sets them apart from the normal human. Each of them is a superhero. Watching the scientists on this field experience solidifies my hypothesis. 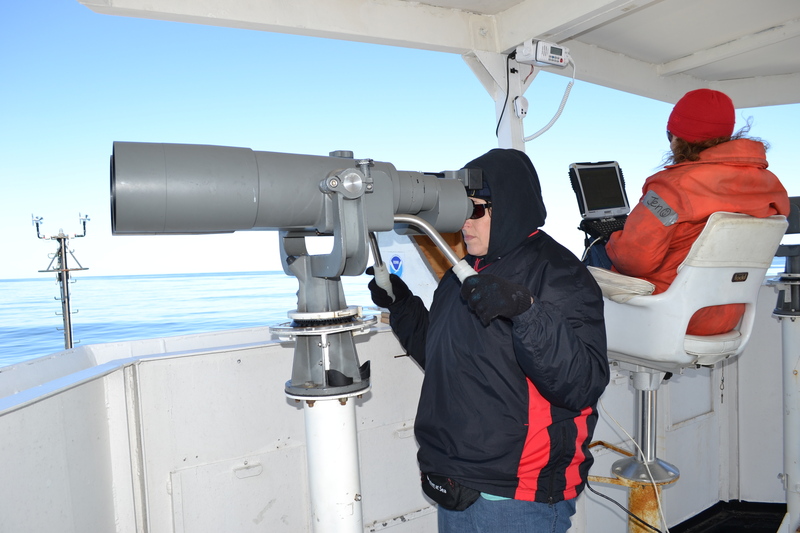 My chief scientist, Allison Henry has the superpower of being able to identify a right whale by glancing at the animal or a photograph the same way I could look at a yearbook and identify a student in my class. This is not a normal skill possessed by regular humans. Scientist, Dave, untangles whales, much like I untangle the Christmas lights each year. Normal people don’t untangle large mammals in the ocean. Aside from possessing supernatural abilities, the new scientists in my collection exude a passion toward their chosen career paths. While these superpowers set them apart, I think that passion is what connects them to us. Maybe my job as an educator is to recognize the passion in each student and encourage him or her to find the superhero within.